It's important for the email recepients to get a correctly formatted email, and I have to assume that some of them use outlook 2003. I also can't assume they will know enough to shutoff the autoclean feature to get the message to format properly. The msg.Body is being read from a UTF-8 encoded text file, and each line is terminated with a crlf. Question: How do I change the format of the message to avoid this problem? Start every line with 2 spaces and outlook will be "tricked" into keeping your formatting. Here is the article I found when researching this problem which goes into a little more depth than my answer. This answer is on how to "disable" the feature from the Outlook Client. Go to Tools -> "Options ..."
In the "Preferences" tab click on "Email Options ..."
Uncheck the box "Remove extra line breaks in plain text messages." I have always had better luck formatting e-mails as html. You may still have the end-user issue of having to set the client to allow html format, but they are usually more familiar with this since so many e-mails do come html formatted. You also have a little more work on your end adding the html tags, but the end result is much more controllable. @ephemient also suggests: Send as both HTML and plaintext. Good clients will show the latter, Outlook will show the former, everybody is happy (except the programmer who has to do more work). Adding "\t\r\n" ( \t for TAB) instead of "\r\n" worked for me on Outlook 2010. I'm seeing the same problem when generating a plain-text email and then reading it with Outlook 2003 SP3. It appears you can avoid the removal process by it by keep the line length under 40 characters. May not always be practical. Put the text in <pre> Tags and outlook will format and display the text correctly. i defined the font-family to have to font set. 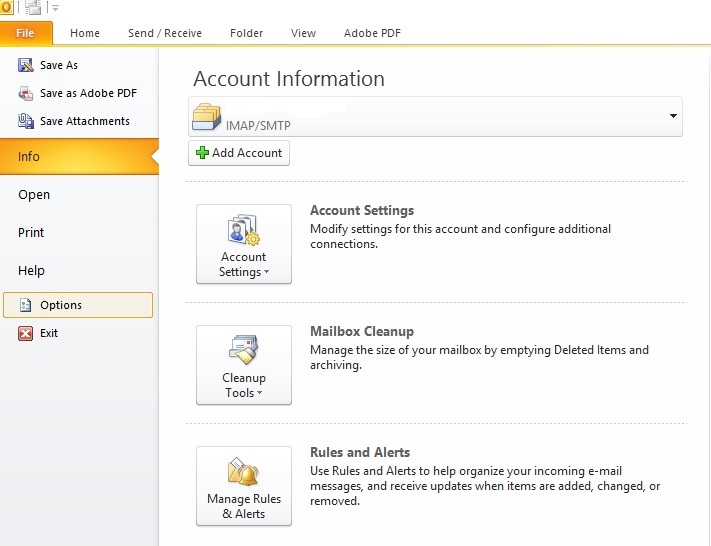 Auto cleaning is an outlook feature which removes extra line breaks. You can prevent it by two ways. First way is to add at least 2 extra spaces before lines while sending the email through code. You can add these extra spaces only before those lines which outlook automatically removes. 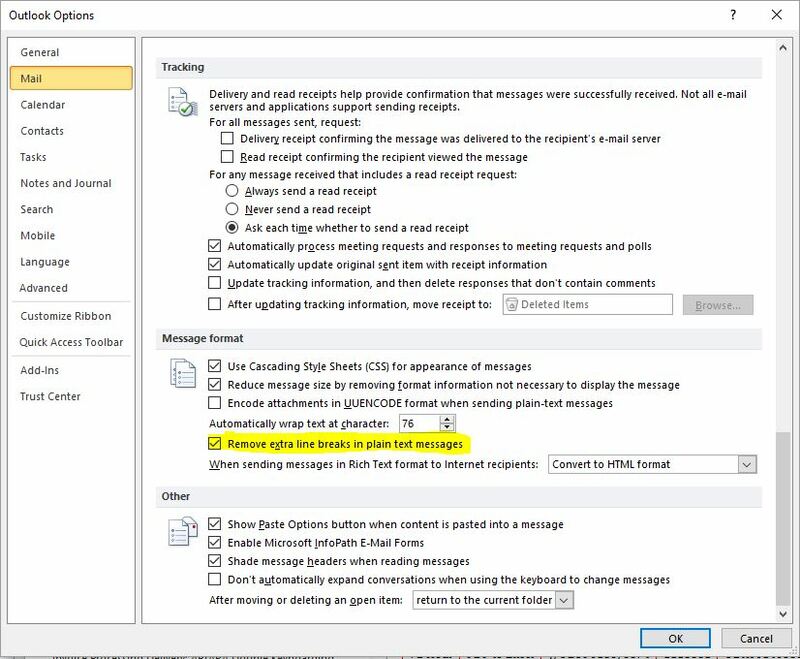 Second way is to change outlook setting which will prevent outlook from removing extra line breaks. My text includes '\r\n' but Outlook 2010 does not render line break. Create tokens of lines delimited by '\r\n' and envelope tokens by HTML Paragraph tags. My Email format is HTML. I am generating HTML Body for my email in the code below. Change your line termination from crlf to either cr or lf. I suspect that the top of the email uses only cr (or lf), and Outlook expects the rest of the email to follow the same format. Not the answer you're looking for? Browse other questions tagged .net utf-8 outlook smtp or ask your own question. How do I format a String in an email so Outlook will print the line breaks? How do I properly print a multi-line variable in an e-mail sent from a BASH script?